The RP Photonics Buyer's Guide contains 11 suppliers for photonic crystal fibers. 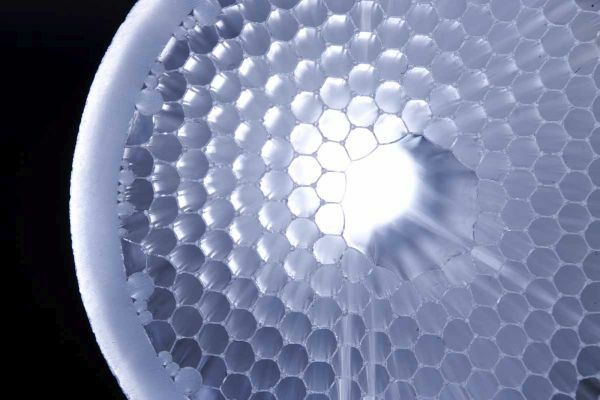 Ask RP Photonics whether a photonic crystal fiber would have advantages over a conventional fiber for your application, or ask for modeling of pulse propagation in photonic crystal fibers. The latter can be done with the RP Fiber Power software. 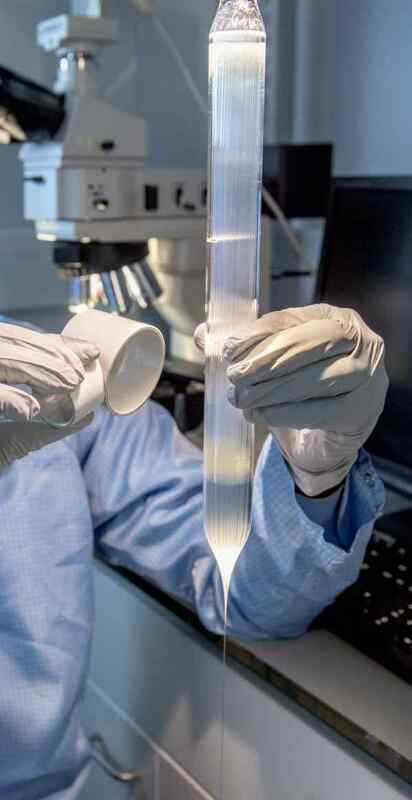 Pioneered by the research group of Philip St. J. Russell in the 1990s, the development of photonic crystal fibers and the exploration of the great variety of possible applications have attracted huge interest. The field, which constitutes a part of the wider field of photonic bandgap structures while incorporating other ideas as well, can be considered as one of the most active fields of current optics research. This is partly because these fibers offer many degrees of freedom in their design to achieve a variety of peculiar properties, which make them interesting for a wide range of applications (see below). 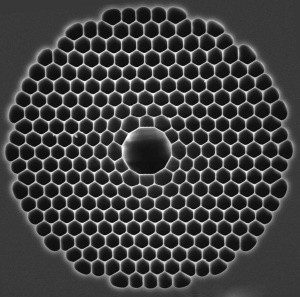 Figure 1: A frequently used solid-core photonic crystal fiber design. There is a triangular pattern of air holes, where the central hole is missing. 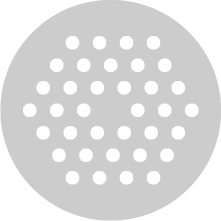 The gray area indicates glass, and the white circles air holes with typical dimensions of a few micrometers. Only the region around the core is shown. A photonic crystal fiber (also called holey fiber, hole-assisted fiber, microstructure fiber, or microstructured fiber) is an optical fiber which obtains its waveguide properties not from a spatially varying glass composition but from an arrangement of very tiny and closely spaced air holes which go through the whole length of fiber. Such air holes can be obtained by using a preform with (larger) holes, made e.g. by stacking capillary and/or solid tubes (stacked tube technique) and inserting them into a larger tube. Usually, this preform is then first drawn to a cane with a diameter of e.g. 1 mm, and thereafter into a fiber with the final diameter of e.g. 125 μm. Particularly soft glasses and polymers (plastics) also allow the fabrication of preforms for photonic crystal fibers by extrusion [13, 33]. There is a great variety of hole arrangements, leading to PCFs with very different properties. All these PCFs can be considered as specialty fibers. The simplest (and most often used) type of photonic crystal fiber has a triangular pattern of air holes, with one hole missing (see Figure 1), i.e. with a solid core surrounded by an array of air holes. The guiding properties of this type of PCF can be roughly understood with an effective index model: the region with the missing hole has a higher effective refractive index, similar to the core in a conventional fiber. Figure 2: Microscope picture of the end of a hollow-core fiber. The photograph has been kindly provided by NKT Photonics. There are also so-called photonic bandgap fibers (PBG fibers)  with a totally different guiding mechanism, based on a photonic bandgap of the cladding region. The latter mechanism even allows guidance in a hollow core (i.e. in a low-index region) (see Figure 2), such that most of the power propagates in the central hole (→ hollow-core fibers). Such air-guiding hollow-core photonic crystal fibers (or air core bandgap fibers) can have a very low nonlinearity and a high damage threshold. They typically guide light only in a relatively narrow wavelength region with a width of e.g. 100–200 nm and can be used e.g. for pulse compression with high optical intensities, as most of the power propagates in the hollow core. Most PCFs are made of pure fused silica (→ silica fibers), which is compatible with the above-mentioned fabrication techniques. However, various PCFs made of other materials have been demonstrated, most notably of heavy metal soft glasses and of polymers (plastic optical fibers), sometimes used even for terahertz radiation . Figure 3: Inspection of a preform for a photonic crystal fiber. The image has been kindly provided by the Optoelectronics Research Centre, University of Southampton. Laser-active PCFs for fiber lasers and amplifiers can be fabricated, e.g., by using a rare-earth-doped rod as the central element of the preform assembly. Rare earth dopants (e.g. ytterbium or erbium) tend to increase the refractive index, but this can be precisely compensated, e.g. 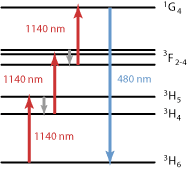 with additional fluorine doping, so that the guiding properties are determined by the photonic microstructure only and not by a conventional-type refractive index difference. With rare-earth-doped PCFs, it is possible to realize, e.g., soliton mode-locked fiber lasers operating in the 1-μm region, where a fiber's chromatic dispersion would usually be in the normal dispersion regime, but can be anomalous for suitable designs [7, 15, 16]. For high-power fiber lasers and amplifiers, double-clad PCFs (Figure 4) can be used, where the pump cladding is surrounded by an air cladding region (air-clad fiber). Due to the very large contrast of refractive index, the pump cladding can have a very high numerical aperture (NA), which significantly lowers the requirements on the pump source with respect to beam quality and brightness. Such PCF designs can also have very large mode areas of the fiber core [4, 26] while guiding only a single mode for diffraction-limited output, and are thus suitable for very high output powers with excellent beam quality. Another advantage is that the pump light is kept away from any polymer coating, thus avoiding possible problems with overheating of a coating. Doped photonic crystal fibers have favorable properties also for use in fiber-based chirped-pulse amplification systems with very high output peak power. It is possible to obtain a very high numerical aperture of e.g. 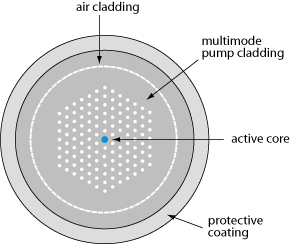 0.6 or 0.7 of multimode fibers (also for the pump cladding of a double-clad fiber) . Single-mode guidance over very wide wavelength regions (endlessly single-mode fiber) is obtained for small ratios of hole size and hole spacing . Extremely small or extremely large mode areas (possibly with a lower NA than possible with a conventional fiber) are possible. These lead to very strong or very weak optical nonlinearities. PCFs can be made with a low sensitivity to bend losses even for large mode areas . Certain hole arrangements result in a photonic bandgap (→ photonic bandgap fibers), where guidance is possible even in a hollow core, as a higher refractive index in the inner part is no longer required. Such air-guiding hollow-core fibers are interesting e.g. for dispersive pulse compression at high pulse energy levels. Particularly for larger holes, there is the possibility to fill gases or liquids into the holes. Gas-filled PCFs can be exploited for fiber-optic sensors, for nonlinear spectral broadening at very high power levels, or for variable power attenuators. Asymmetric hole patterns can lead to extremely strong birefringence for polarization-maintaining fibers . This can also be combined with large mode areas. Strongly polarization-dependent attenuation (polarizing fibers) [18, 24] can be obtained in different ways. For example, there can be a polarization-dependent fundamental mode cut-off, so that the fiber guides only light with one polarization in a certain wavelength range. Similarly, it is possible to suppress Raman scattering  by strongly attenuating longer-wavelength light. Very unusual chromatic dispersion properties, e.g. 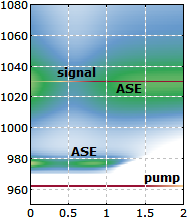 anomalous dispersion in the visible wavelength region , result particularly for PCFs with small mode areas. There is substantial design freedom, allowing for different combinations of desirable parameters. Core-less end caps can be fabricated simply by fusing the holes near the fiber end with a heat treatment. The sealed end facets allow for larger mode areas at the fiber surface and thus a higher damage threshold, e.g. for amplifying intense nanosecond pulses. Multicore designs are possible, e.g. with a regular pattern of core structures in a single fiber, where there may or may not be some coupling between the cores. Ends of PCFs may not be cleaned with liquid solvents, such as ethanol, as capillary forces may pull them into the hole. Of course, the guiding properties can be strongly modified with any liquid in the holes. There is even research on exploiting such effects, e.g. for generating a tunable amount of optical loss by controlling the degree to which a liquid penetrates the holes. Cleaving and fusion splicing PCFs is possible, but can be more difficult, particularly for fibers with large air content. During fusion splicing, the air may expand and distort the fiber structure. Connections between fibers are also possible with a variety of mechanical splices, fiber connectors, protected patch cables, beam expansion units, etc. Even when the splicing process works well, there may be a substantial coupling loss due to a mismatch of mode areas, e.g. when a small-core PCF is coupled to a standard single-mode fiber. There are special tapered single-mode fibers and tapered PCFs for enhancing the coupling efficiency, but these may not be easily available. fiber lasers and amplifiers, including high-power devices, mode-locked fiber lasers, etc. quantum optics, e.g. generation of correlated photon pairs , electromagnetically induced transparency, or guidance of cold atoms. Even though PCFs have been around for several years, the huge range of possible applications is far from being fully explored. It is to be expected that this field will stay very lively for many years and many opportunities for further creative work, concerning both fiber designs and applications.